Our team of professional locksmiths offers a complete and comprehensive array of commercial security solutions. These solutions are designed to increase overall security and safety at businesses of all types and sizes. 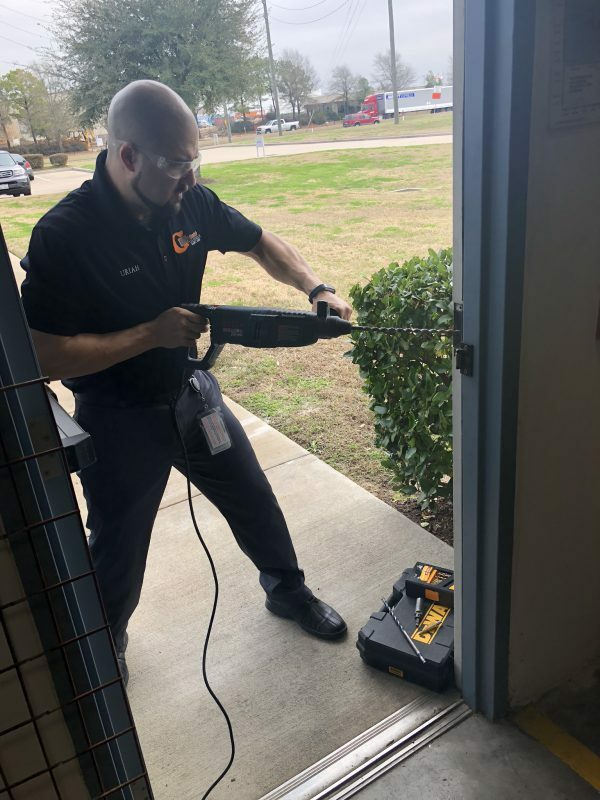 For years Guardian Safe & Lock has been assisting and providing security solutions for businesses in the Greater Houston Area. We carry and service nearly any locking device used in commercial buildings today. From rekeying to new lock installation, we can provide you with the highest quality locksmith services at the most competitive price. When it comes to your business safety and security, you need a trusted locksmith to keep your business secure. Choose experience and stability, with Guardian Safe & Lock your prompt and dependable locksmith service is just a phone call away. When you are dealing with an office lockout or a tenant eviction, there is no reason to pry open the door causing further damage. The ideal solution would be to call an experienced commercial locksmith that could solve the lockout service with ease and efficiency. In most cases we can gain entry and rekey your locks in under 20 Minutes. To be in compliance with standard fire codes, more than likely your business will require panic bars or alarm exit devices. These devices provide egress during emergency situations for employees and or customers. So it’s important that they operate correctly 100% of the time after being installed. We can replace or repair any exit alarm device, on any door. Their main function is to prevent unauthorized egress, from a side or back door. This allows you to focus on your business without having to constantly monitor the exit itself. Our experienced commercial locksmith technicians have installed many different types and styles of door closers. No matter what type of door you have we have a door closer solution that will work for your business. The installation of a door closer provides a necessary function for every business. Call today for your free door closer assessment. Electric strikes are basically the workhorse of access control systems, intercoms and other door systems. When they are not functioning properly, the whole system is unresponsive. This needs to be maintained by a professional access control technician. Our experienced access control technicians are trained to work on various low voltage electric strikes. While also having the ability to diagnose and solve any other issues regarding the lock itself. We will run the needed wire for communications between the electrified hardware. We will also install the electric strike, card access, intercom, door closers and the mechanical locks. Regardless of what type of lock is currently on the door, we have the electric strike solution for it. Our experienced commercial locksmith technicians can help you get a master key system established. This will greatly enhance the security of your office environment. A master key system is one of the best ways to customize the security restrictions in your office or building. With a master key system, employees are provided restricted access to only certain door locks. While maintenance, management and other high ranking individuals are given the master key that will unlock all the doors within the building. This is an ideal security solution our commercial locksmith technician can provide for your business. If you want to keep your business safe from unnecessary thefts, then you know how important security is. You may also need to give your employees easy access to sections of your office building in order to do their job effectively. Balancing these two things should not have to be a difficult task, but master key systems present a simple, effective solution. Master key systems are entirely customizable by the owner of the business, giving you multiple tiers of “access privileges”. This allows you to design a purposeful security system that works for your business and employees. Our high security keys and locks provide two important benefits over standard locks. The first is the added physical security. The commercial locksmith technician will utilize a product called ‘Primus,’ which is made by Schlage. This is a patented key way that has additional side cuts that make the lock nearly impossible to duplicate or manipulate. These side cuts work with a side-bar that’s inside the lock. The side-bar is an added security feature to the cylinder that keeps the wrong key from turning the lock. Another benefit of having a high security key system is key control. The Primus keys we carry are serial numbered and exclusive to our company. These type of high-security keys are impossible to duplicate at any other hardware store or locksmith shop. Only a person with the proper identification or a special authorization card will be allowed to get additional copies of Primus keys. This is shown as an order to prove that the right person is getting the duplicate keys. We’ll even keep key counts and give you detailed reports on what keys were created on what dates. This proves essential to any company’s record keeping whenever items come up missing or stolen.